As Head of the National Police Serhiy Knyazev flew from Kyiv to Cherkasy region along the jammed Kyiv-Odesa highway, he filmed a multi-kilometer traffic jam that had formed amid heavy snowfall. "Cars stuck in snow on Kyiv-Odesa highway. I'm flying to Cherkasy region, where multi-kilometer traffic jams have formed, to find out about the developments on the ground and restore traffic," Knyazev tweeted. 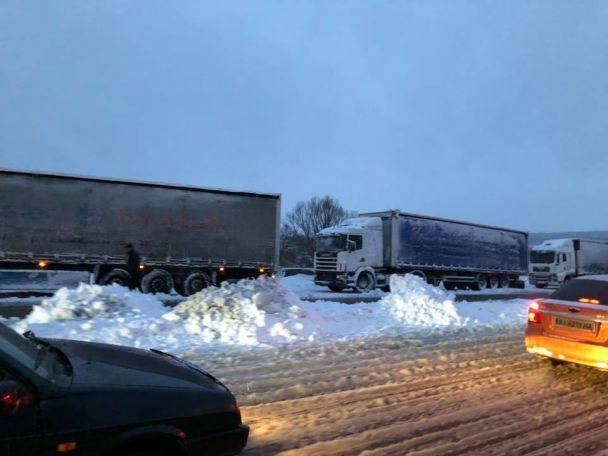 It should be noted that the forces of the Ministry of Internal Affairs have been deployed to deal with the impassable traffic conditions caused by heavy snowfall at the border of Cherkasy and Kyiv regions, as stated by Interior Minister Arsen Avakov. "Crisis situation on the border of Cherkasy and Kyiv regions. More than a hundred of heavy vehicles have been stranded in the snow for more than 24 hours," the minister said. According to him, the head of the National Police Sergey Knyazev and chairman of the State Emergency Service Mykola Chechotkin flew to the area to coordinate emergency relief efforts. "With additional forces, they must swiftly release people and vehicles from snow captivity," Avakov said. As UNIAN reported, snowfalls, blizzards and thick ice on December 18 wreaked havoc on the section of the Kyiv-Odesa highway between Bila Tserkva and Zhashkiv as multi-kilometer traffic jams were formed. As of December 20, rescuers are taking measures to eliminate a 7.5km long jam. A slow movement of freight and passenger vehicles is recorded in both directions. Movement of all vehicles has been limited in the area. According to the State Emergency Service, 19 towing vehicles are involved in the operation, while only 402 cars have been released from snow captivity so far. Two mobile heating stations have been deployed in the area.